Native to tropical America, cat's claw creeper is an aggressive climber that was once used as an ornamental plant in Queensland gardens. In the wild, cat's claw creeper can smother native vegetation and change soil chemistry. It is now found in many parts of Queensland. 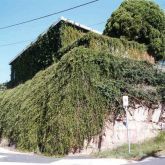 Cat's claw creeper is a restricted invasive plant under the Biosecurity Act 2014. 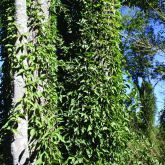 Large woody vine that climbs and creeps aggressively. 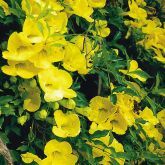 Flowers are yellow, bell-shaped, 4-10cm long, up to 10cm wide. 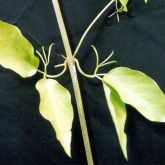 Leaves have 2 leaflets 5-25mm long, with 3-clawed tendril (cat's claw) 3-17mm long growing between them. Pods are long, narrow, flat, contain many seeds. Fruit is elongated, glossy green when young, dark brown as it matures, 15-50cm long, 8-12mm wide. Each fruit contains numerous oblong seeds, 10-40mm long, 4-10mm wide. Plant has vigorous root and tuber system. Prefers warm-temperate, tropical and subtropical areas. 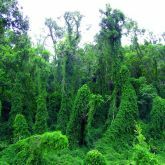 Can be found in gardens, over fences, along roadsides and waterways, and in disturbed rainforest. Found in coastal and subcoastal areas of South East Queensland. Also occurs in central and north Queensland. Flowers mainly during spring and early summer. Smothers native vegetation, including growing up over trees. Spread by water and wind. Tuberous roots also spread by floods and humans. Digging tubers out is not practical in most cases. Don't allow regrowth to reach host tree's foliage, otherwise you will have to re-cut them. Treat regrowth with foliar spray. Glyphosate 360 mixed at rate of 83mls to each litre of water can be applied in cut-stump method. It is best done in pairs. First, cut lead as close to ground as possible and spray/paint chemical on. Apply glyphosate within 15 seconds of cutting while sap is running to take poison to roots and tubers. If you miss 15-second mark, cut lower and try again. Because of multitude of tubers, herbicide tends to knock tubers down one at a time with new regrowth coming from next tuber. Be prepared to continue control over next 5 years. 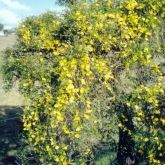 See the Cat's claw creeper fact sheet (PDF, 1.2MB) for herbicide control and application rates. Currently a target for biological control. Tingid bug Carvalhotingis visenda and leaf-tying moth Hypocosmia pyrochroma have been released widely. Field release of leaf-mining jewel beetle Hylaeogena jureceki commenced in September 2012. Tingid is widely established in majority of release sites and has caused visible effects in some areas. Leaf-mining jewel beetle is target-specific and can severely damage cat´s claw creeper.